The armchair version of our Paul sofa is modern and minimal. With a wooden frame and sprung seat platform, the foam cushion seat is overlaid with a feather wrap for the cushiest of cushiness. A simple perch that's designed especially for rainy, workless Saturday afternoons spent doing the crossword and sipping a cheeky early evening G&T. Please note that seams may vary depending on which fabric you choose. The Paul comes in over 100 fabrics, from deep velvets to fresh linens - all home delivered within 5 weeks. Why not include some scatter cushions in the same fabric as your armchair? We offer single cushions and sets of two that'll be delivered directly with your order. Minimal lines create a stylish and masculine edge for the Paul collection. These pieces are sleek and modern with smooth seats, plump soft cushions and stylish metal legs providing a pleasingly clean finish. 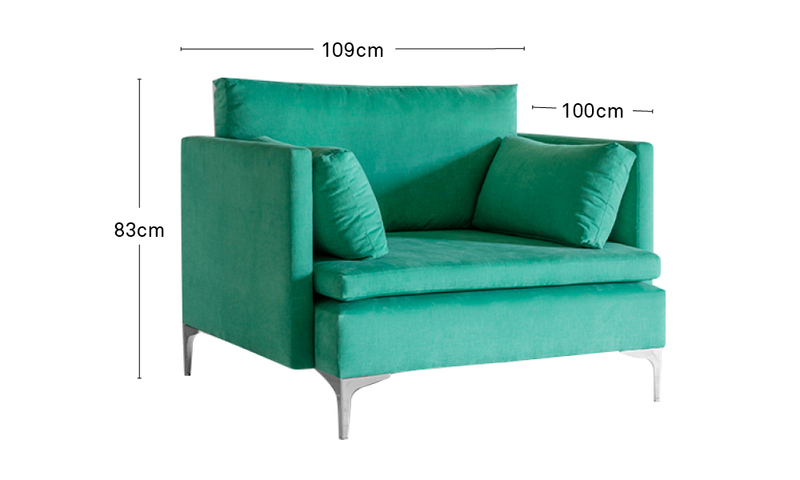 The Paul is available as a sofa, armchair, chaise and footstool in your choice from our 130 fabrics.